A primary goal of the Drinks Destroy Teeth program is to arm kids, teachers, dentists and other health professionals with a collection of free resources to spread the word about dental erosion. On this page you will find links to download our acidity brochure, lesson plans, PowerPoint presentations and also a list of links to other dental erosion campaigns. The Drinks Destroy Teeth Patient Fact Sheet is a perfect handout for patients, students, family and friends. This resource outlines the potentially harmful effects of drinking sugar-laden and acidic drinks, and ranks common drinks according to their sugar and acid contents. Click on the tabs below to download or see a description of each Drinks Destroy Teeth lesson plan. Students place hard-boiled eggs into various solutions overnight. 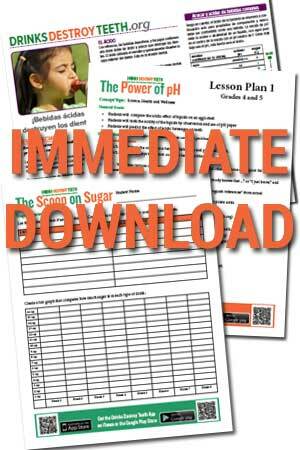 Click here to download the lesson plan and lab sheet (PDF). Special thanks to Becky Floetker for creating the lesson plans and lab sheets.